I'm in love with everything. Honestly. I don't have a matching coffee mug set because I'd get bored without my mix and match collection. I don't have the same style of dining chairs around my table because I like too many different styles, and I could never NOT display all my fantastical wall art together just because there are too many styles and sizes and medium. The solution to my eclectic taste in wall art is, of course, a gallery wall. Art gallery walls are all over Pinterest and home blogs and I love the hodge-podge, yet chic effect of having all my favorite images together. 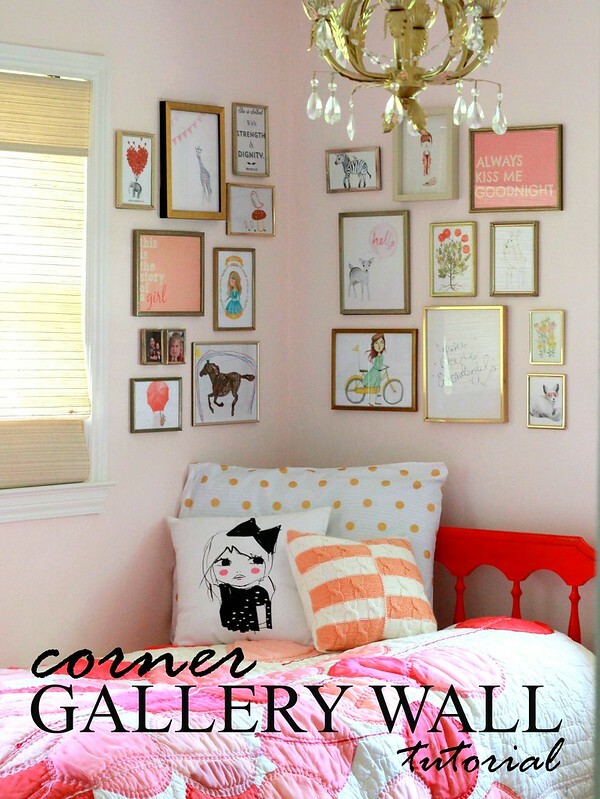 There are obviously tons of professionals who have posted the finer details on how to hang a salon-style gallery wall, but the whole idea of blogging is to share information from my point of view, so here's how I selected the art and styled the corner art gallery in the bedroom of my daughter. 1. I don't have a fortune to spend on frames (I'd rather reserve my dough for the art) so I pick up vintage gold frames from Goodwill on 50% off day. I also get lots of inexpensive white frames from Ikea. 2. Trace your frame onto plain white paper and write a description of the image onto the paper so you know which print that paper represents. 3. 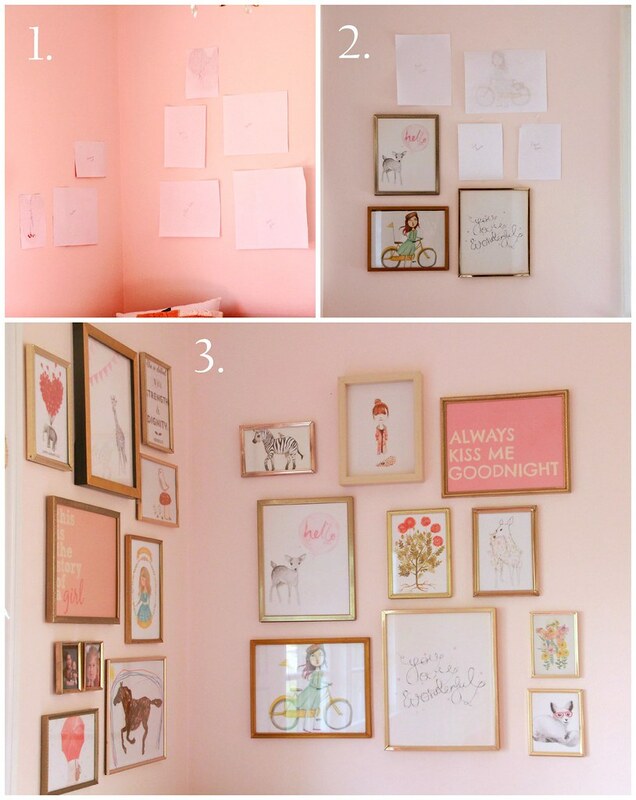 Tape the papers to the wall in the arrangement you want. This is much easier on your walls than that ol' hammer-and-nails routine. 4. 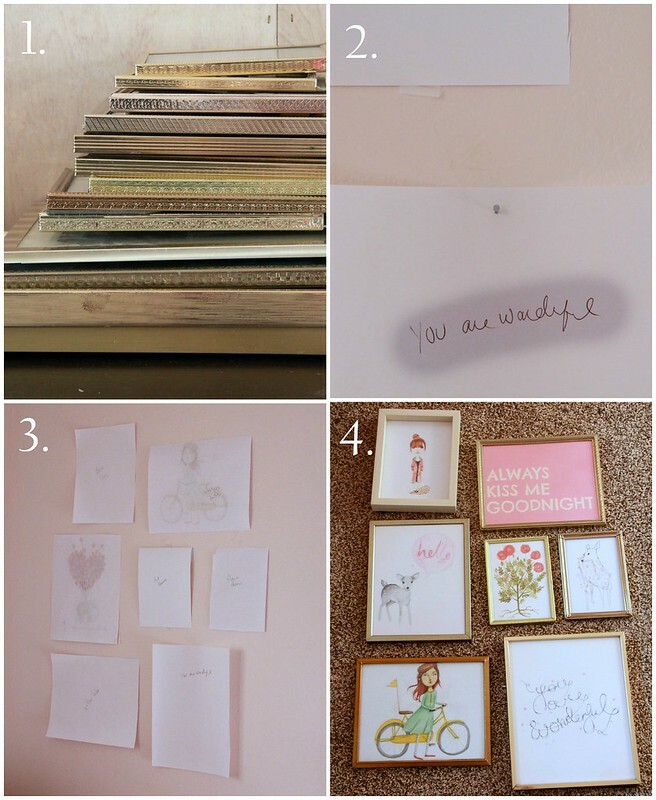 Lay your art out on the floor in the same way you've planned on your wall to confirm you like the arrangement and display of colors as a whole. Adjust anything you don't like by rearranging the papers. 1. Once you've got the first wall arranged, move around to the other side and repeat the first four steps. 2. 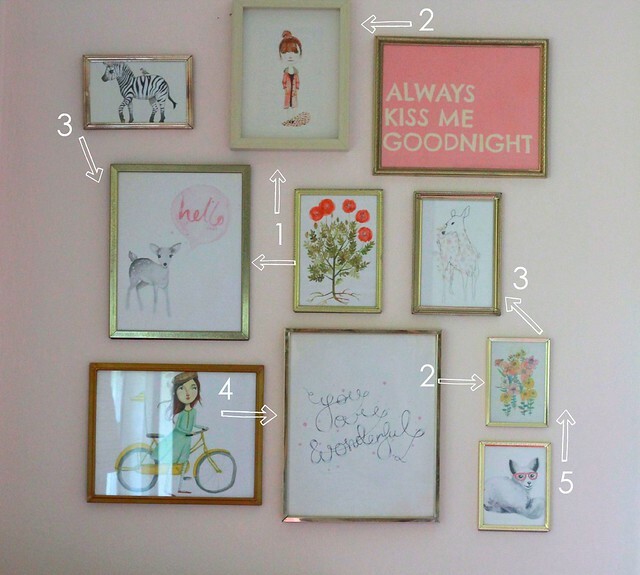 Hang your art by nailing in the exact spaces where you've taped the paper descriptions. 3. Make any necessary picture switches or adjustments. At this point, I triple fold a piece of tape and place it on the back lower left corner to keep frames from hanging crooked or falling if bumped. Obviously, this is really a matter of preference, but I like to hang a mix of things that reflect personalities and ideas that are worth aspiring to. Here's my list of art to include in an art gallery (the art source information for my corner gallery is on this post). 2. 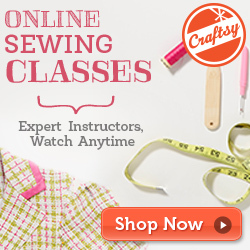 Handmade printables are easy to come by with a little creativity and programs like PicMonkey. If you don't own a color printer, Kinkos and Walmart can print them for you at a much cheaper price than purchased art. 3. 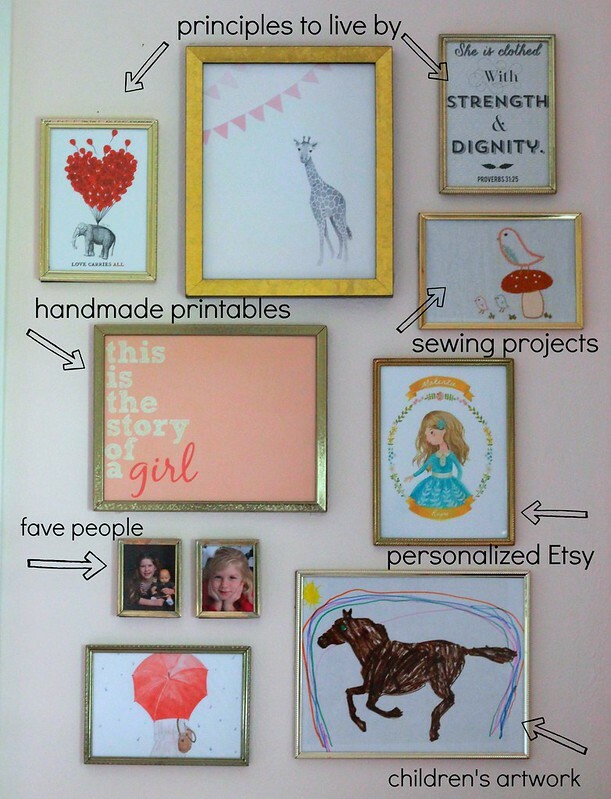 The walls in our home are covered in the hand-sewing projects completed by my children and myself. It's a sentimental version of the hand-drawings that are readily available from school or church. 4. Pictures of favorite cousins and friends are turned into wall art as opposed to taping pictures to the refrigerator. Plus, it's fun see their pictures and be reminded to pray for them during bed-time prayers. 5. Personalized art from Etsy is a go-to for me. 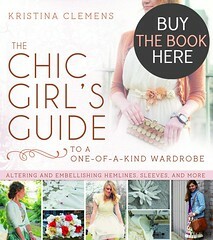 See my Etsy art print picks fpr this gallery here. 6. Nothing boosts a child's self-esteem more than having their art work placed in a frame and hung on the wall with the rest of Mommy's favorite art. Instant smiles! 7. Feature the original architecture of your home. We bought a mid-century home that had a vintage Nu-Tone intercom system wired into the bedrooms. The system no longer works, but rather than remove and drywall the holes, we retained a piece of history and arranged the images around the intercom plate, letting Nu-Tone become its own work of art. 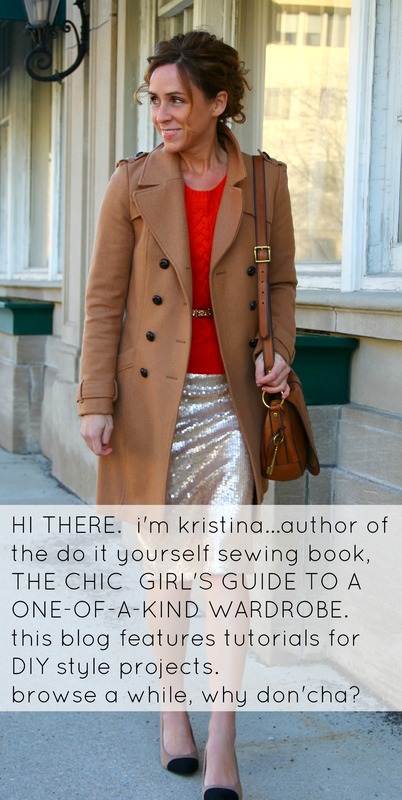 I go with one main rule in this area--opposites attract. 1. 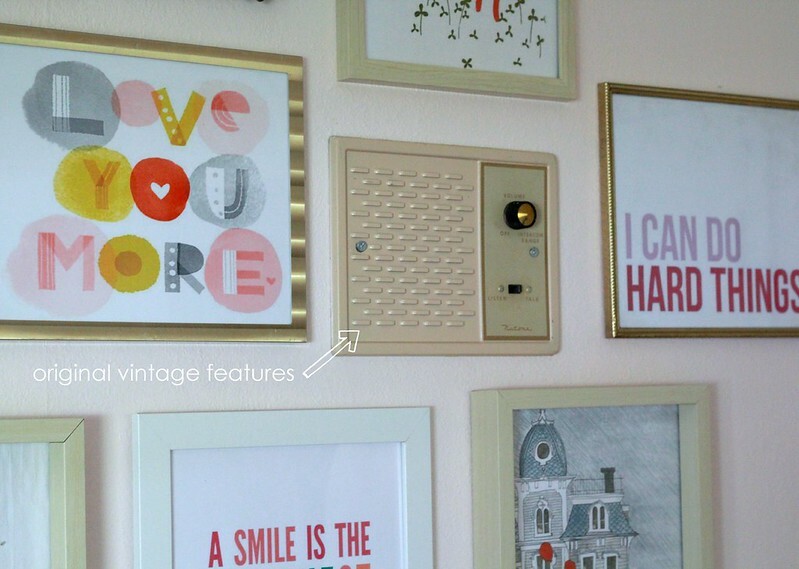 Place vintage prints next to modern ones. 2. Space the typography and word messages apart from each other. The eye needs a place to rest and when words are right next to each other, people will get stuck trying to read them instead of enjoying the gallery as a whole collection. 3. Place realistic images next to abstract ones. Putting a print of realistic flowers next to a literal image of an animal is just not as interesting as a biology book flower sketch next to the shape of a deer sketched of flowers or a spectacle-wearing fox. 4. Work whimsical character images into spaces near typography or more realistic images. 5. Mix your images so animals and people and plants are interspersed, rather than placing all the plant prints together or the animal prints near each other. The end result is a corner art gallery that uniquely reflects my daughter's personality and personal tastes while also being a fantastic decorative focal point to her bedroom. What do you think? 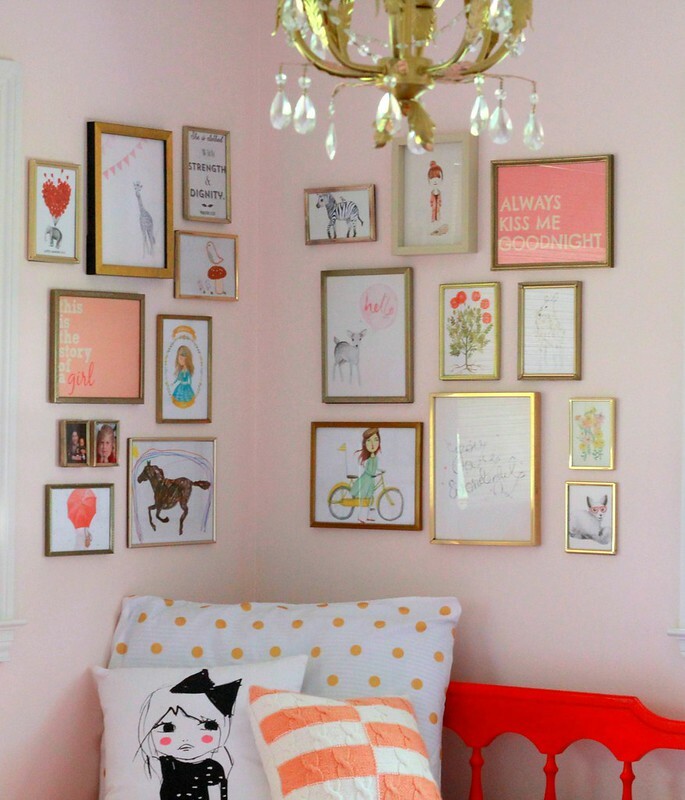 Would you ever hang a corner art gallery in your home?